On Sunday October 21st, dozens of Scarborough families arrived at Centennial College’s School of Hospitality, Tourism, and Culinary Arts, to take part in a new type of event. Arriving an hour past noon, the families were seated and served lunch – platters of sandwiches, vegetables and dips. The meal was served in what organizers call “family-style”, brought out and placed at tables where families could help themselves. For the families, the entire meal – which included soup and dessert – was free, and prepared in surrounding kitchens by Centennial Culinary Art students. 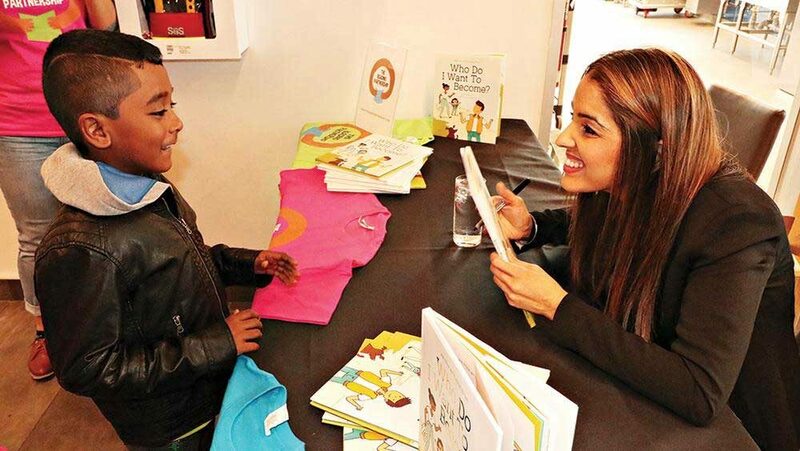 The families were also granted one additional gift that day – a reading from children’s author Dr.Rumeet Billan, along with a free copy of her newly released book, Who Do I Want To Become? The day’s event, called Eating and Reading, was an initiative partnered by Centennial College and The Reading Partnership, a community organization that works to address low literacy rates among children in East Scarborough. “It’s about creating positive habits around eating and reading, so that children can have positive reinforcements,” Dean Joe Baker of Centennial College said about the event. After reading from her book, Dr. Billan led a discussion about a question that children and young people are often asked: what do you want to be? Dr. Billan’s book encourages children, and adults, to instead ask themselves who do you want to be? A question, the author says, that can be answered by character traits and attributes. The event catered specifically to families, and included a chartered bus from Toronto Community Housing, in an effort to keep the opportunity accessible. In total, there were more than 100 guests. It’s something Dean Baker hopes to see again.